I have been using NovoRapid for many of my 'pretending to be my pancreas' years. I had a brief dalliance with Humalog not long after we started writing this blog, but switched back to NovoRapid when I started with Artoo as my DSN had worries about accounts of Humalog crystallising in pump tubing. One of the challenges with NovoRapid, as many users are keenly aware is that it's not very... well... rapid. NovoSluggish perhaps? NovoOhForGoodnessSakeGetAMoveOn! When your blood glucose is stubbornly high and you dose a correction only to find it even higher an hour later it is very tempting to rage bolus it into submission with multiple additional units, only to find that you crash into low blood glucose hours later once they have all started acting together. I once wrote a post about speedboats and oil tankers outlining my frustrations around slow insulin action where everything else seems to act very fast indeed. For those that don't know Fiasp (Faster Insulin Aspart) is the latest insulin from NovoNordisk. It is similar to NovoRapid, but has some additional ingredients that have improved the speed of onset. Official trial data shows a relatively modest improvement, but there has been much excitement in the DOC, and the early experiences shared seemed to suggest some people saw significant differences with faster action and a shorter duration. 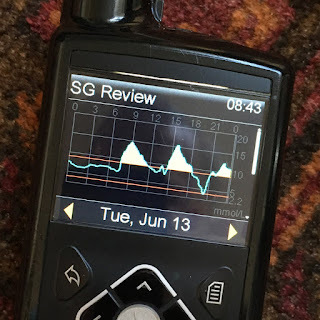 I was keen to try Fiasp to see if I could do away with my reasonably lengthy pre-bolus at breakfast and lunch (taking insulin at least 30 minutes before beginning eating) and also to see if I could see improved/faster action of correction doses. This blog is my n=1 trial of 3 vials, I cannot say how Fiasp would work for you or anyone else, but this was what happened when I tried it. When I spoke to my pump clinic about getting Fiasp they could not prescribe it because it was not yet on the hospital formulary. I had to get it from my GP who could use the PIP code to prescribe it directly. I planned to try it for 3-6 months to give me long enough to experiment with it and give it a decent go. I generally get 3 vials at a time when I order insulin. each u100 10ml insulin vial contains 1,000 units, which at my general Total Daily Dose of 30-35u should last me around a month each, more or less. Looking back, my insulin use has been pretty much as expected, but I used up those vials in 57 days not 90. And I am always careful to draw out every drop out of each vial, conscious of the huge privilege it is to live in a country where insulin is provided free for me by the NHS. I had never realised before how much insulin prescribed to me goes unused. If I lived in the US with their absolutely horrendous price issues it would make a huge difference. Every set change for my insulin pump requires the tubing to be filled, and at the end of the site's life, that full tubing is discarded. I'm careful to only fill reservoirs with just enough insulin for their 3-day life, and have run them to all but empty more than once, but even then, there is a substantial measure of insulin left at the neck which you can't get to. What this has showed me though, is that if planning a lengthy trip away, I would need at least a third more insulin than I might have guessed. I knew that changing the insulin I was using would most likely involve resetting a lot of things - ratios, factors and so on. 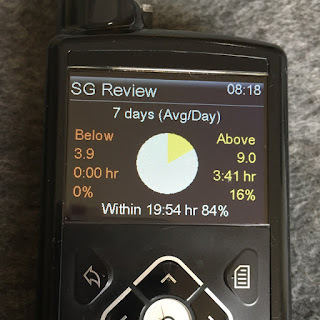 So I decided (looking back this was probably not one of my brightest moments) that it would provide me with a useful opportunity to finally experiment with that mythical 50:50 split that some Healthcare Professionals seem quite keen on where exactly half your insulin is used for basal and half for meals. Along with the 500/100 'rules' that often get mentioned to me in clinic. I have always thought these 'rules' to be useful starting points - academically interesting, but no real substitute for systematic (and repeated) self-testing of basal insulin with fasting basal tests for example. Here was a chance to see how it worked for me. So when I switched to Fiasp, I took an average of my Total Daily Dose (TDD) over the previous 30 days and split it exactly 50:50, then set a flat basal profile to spread that much insulin over the 24 hours. Apparently in most people with a functioning pancreas, the body uses half the insulin for food and half for background. Quite how they have worked this out is beyond me. And I've always thought, "Well surely, doesn't that depend on what you are eating??". But nevertheless the 50:50 thing still floats around and some HCPs raise eyebrows when your split is more 40% basal to 60% bolus as mine is. Part of the reason why I half-thought this might be a useful experiment (apart from my own curiosity and thinly veiled desire to prove that it was nonsense and wouldn't work for me), was that I had read accounts by a few people who had tried Fiasp already that found it had a shorter action. By boosting my basal split to half of my TDD, I reasoned I might soften that out a little. Take less insulin with each meal, but still have some being fed-in continually in the background that I could dial down with a Temporary Basal Rate during exercise/activity. 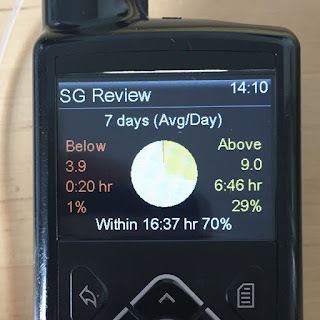 Additionally I was wearing a CGM sensor during this period, and could watch what was going on, plus I had Smartguard to catch me overnight, just in case. 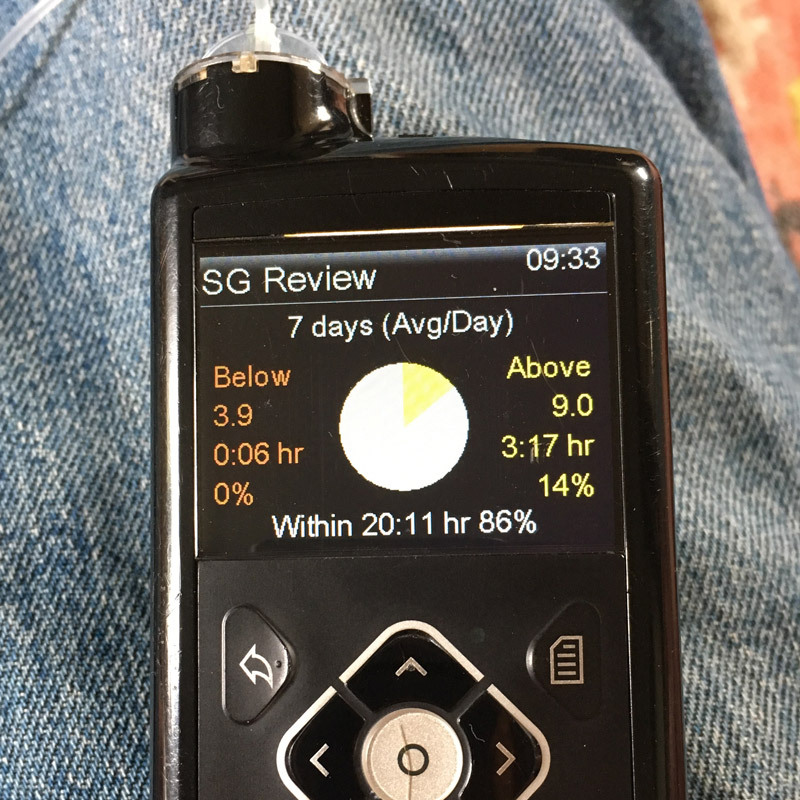 The first morning of my changing-absolutely-everything Fiasp trial showed a dramatic drop overnight - caught by Smartguard and low prevented, but enough to confirm my suspicions that a significant hike in overnight basal insulin would cause me problems going forward. Undeterred, and wanting to give the experiment more of a go I adjusted the pattern to shift some of the basal insulin into the daytime and keep the pattern at 50% of my TDD. The correction factor always works out very similar to the one I generally find works OK for me, but the meal ratio is always a bit of a surprise. More than once in clinic when the subject of hypoglycaemia has come up a calculator has been tapped and mentions made of what my ratio 'should be' according to the 500 rule - I often use 1:10 and 1:11, the 500 rule suggests 1:15. I've always been of the opinion that if my meal ratio were 50% out, I might have noticed, but this Brave New World was an opportunity to have a go and see what happened. After a couple of days I took stock. I had been experiencing a lot of high glucose alarms and had needed to dose several extra corrections to bring my levels back into range. 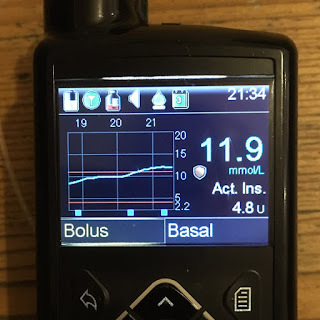 Hilariously when I looked at the splits between basal and bolus I noticed that the extra corrections I had needed pushed me back almost exactly to 40:60 rather than 50:50. My diabetes can be extremely stubborn sometimes. Additionally, I soon realised that the 500 'rule' was massively messing with my attempt to aim for 50:50. Even though I was using my TDD as a starting point, I simply do not eat enough carbohydrate most days for the 500 rule to generate half my TDD. I usually eat around 130-150g of carbohydrate per day. Don't get me wrong... I'm no sandal-wearing low carb evangelist. Sometimes I can eat 120g of carbs in a single meal - but on the whole, I find around 150g is all I need, and helps keep my BG a little more stable. The 500 rule seemed to assume I would be eating 250g of carbs a day. Which I can do, but carbier days are often the less predictable ones in my experience. So I gradually began to tweak my basal profile and opted for more of a mid-point for meal ratios, and the experiment continued. I lasted around a week before I threw the towel in. I only hit the mythic 50:50 split on one or two days (about as many as I do using my own system to be honest). Most of the days with the 500-rule-ratios involved significant corrections due to rising levels, however quickly Fiasp may have been working. And more often than not these pushed my basal:bolus split back to where it normally sits. If you've waded through these ramblings so far (congratulations, some sort of perseverance medal is clearly in order) you will understand why I am choosing to pretty much ignore my first week's experience with Fiasp. Looking back at that first week though, I will just briefly mention in passing that we were away on holiday and so there were a good few treats to test Fiasp's rapid action. I was also experimenting with not pre-bolusing for breakfast or lunch. Early results were promising once I had tweaked my ratios a little. Doses for other things, like white bread, ice cream, cake, beer did seem to be starting to act more rapidly, and where I'd misjudged things and was dosing for corrections they seemed to be starting to act within 25-30 minutes rather than my expected 60 minute wait with NovoRapid before I see much BG reduction. I think it's fair to say that Fiasp had its work cut out because in the months before trying it, partly powered by the occasional CGM sensors I've been running this year, NovoRapid had been unusually cooperative. Many weeks with more than 80% of sensor readings in range and with almost no minutes below 4.0mmol/L. I did still need to pre-bolus, but only about half as much. Perhaps 15-20 minutes at breakfast and 10-15 minutes at lunch. Much more than that and I risked dipping low before the carbs kicked-in. 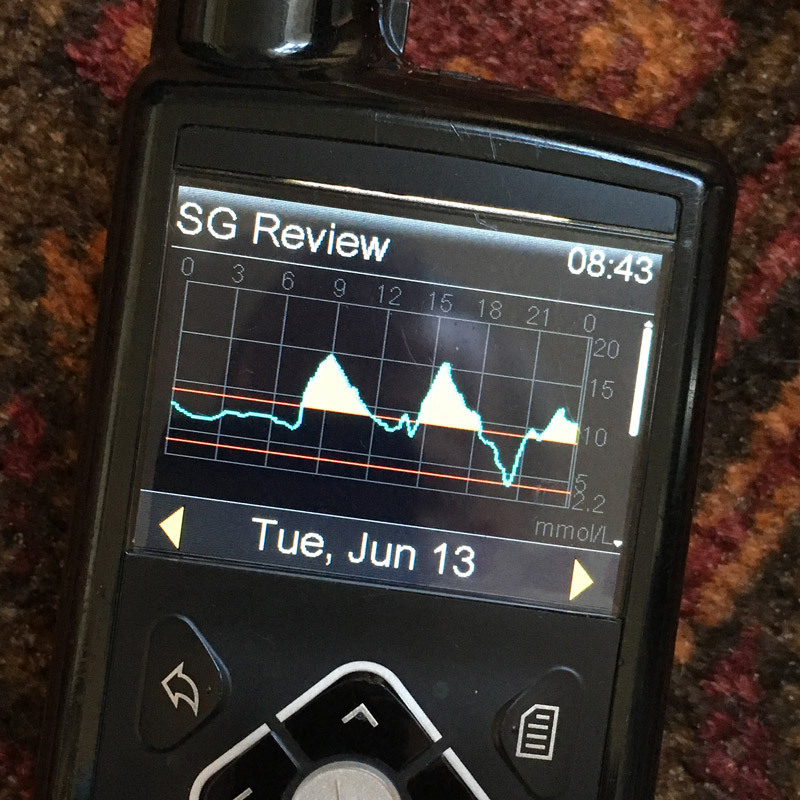 Smartguard occasionally mangled these square and dual waves, cutting basal insulin and stopping the remaining bolus following a small dip in BG and just as the carbs began to hit, resulting in the dose only being delivered later on when I noticed what was happening. This was intensely frustrating. Breakfast was my biggest challenge. Lower carb weekday ones (15-20g carbs) were relatively OK, but bigger weekend ones (45-50g carbs) were a nightmare. At some points in the year I can find I have to add an extra mini-bolus to account for my liver dumping glucose when I crawl out from under the duvet (even though my basal pattern always kicks-up at this time), but even that tried and tested strategy didn't keep me out of the teens after breakfast at the weekends. In the end I used a surprisingly strong bolus ratio that scaled the doses upwards where I was eating more. Fiasp performing pretty well at 3-4 weeks in. There was definitely a point, when I'd been using Fiasp for about 3-4 weeks where I began to see distinct potential. There were still some horrendous numbers to be found, but there were some great successes too. For example, a Tapas meal out one Sunday with delicious breads, patatas bravas, beers and all sorts of incalcucables that was bolused late, in a series of guesses and to correct my earlier underestimates of carbiness where I could actively see Fiasp's faster action helping me out. It was also at this time that my results around breakfast greatly improved, which helped a lot in improving my time-in-range. What it made me realise, I suppose, was that after something like 15 years of using NovoRapid I had memorised a lot of 'exceptions to the rules'. Little tricks and strategies that I use, almost without thinking, to work around NR's particular activity profile and my individual BG response to different foods. When switching to Fiasp, I was needing to re-invent a lot of these, and discover a whole lot of new ones. If the switch was to become permanent, it would take time to build up this knowledge. Unfortunately my successes were fairly short-lived. I can see the Standard Deviation (how spread apart my BG results were) taking a leap upwards after about 10 days of beginning to feel I was making progress. During this phase of my Fiasp experiment my basal and bolus requirements seemed to be heading inexorably upwards once again (they had kicked upward after a couple of weeks, but I'd seen that happening to others and didn't stress about it too much). At the same time I was finding my earlier shorter pre-boluses less and less effective, and had more or less reverted to exactly the timings I would use with NovoRapid. Additionally, I no longer needed to dual or square wave those well known 'all up front' meals as I had in the first few weeks. Even more perplexingly, rather than acting more rapidly, sometimes my corrections of high BG values seemed to have no effect at all. I would be watching a sensor trace waiting for a high or rising BG to be corrected and nothing would happen. I began to throw in 2u and 3u speculative 'turnaround' corrections to try to halt a rising BG only to see it continue to rise, and where I was expecting to have to mop-up the excess insulin with carbs later, the dose seemed largely to disappear entirely. As an example, in the image you can see my BG rising after an early evening meal. The blue dots along the bottom represent corrections. The first, before 7pm was in response to an 'alert before high' which indicated I would be rising to 11mmol/L within 30 minutes. I gave a small correction (0.7u) which aimed to take the edge off the rising BG. 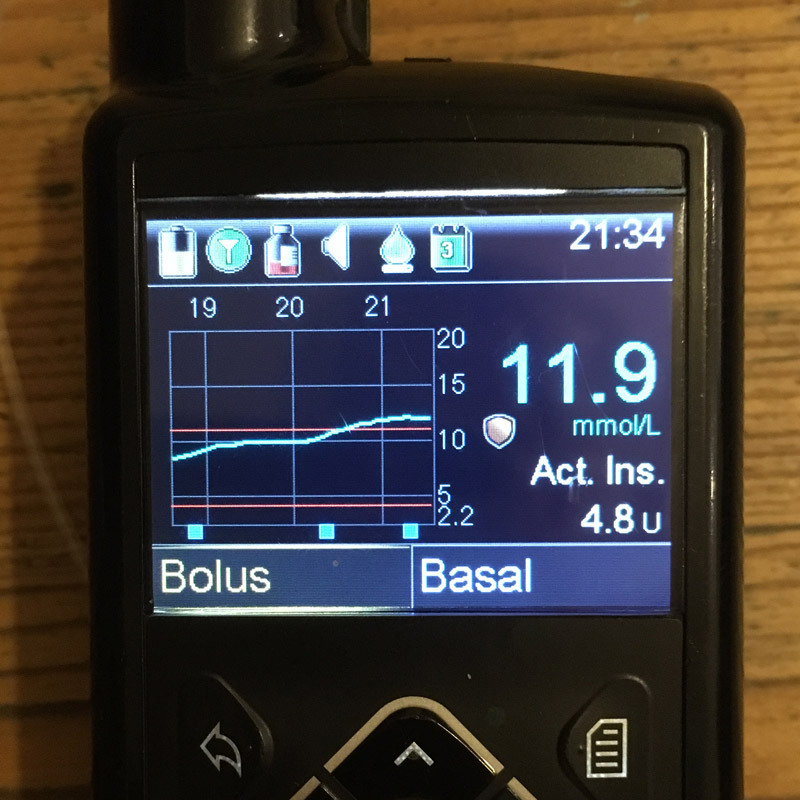 Over an hour later, not only had the remainder of the meal bolus not reduced my BG, but the additional correction was not doing much either. By 8.20pm or so I was getting a little frustrated and bolused 3u planning to watch and wait - mopping up with some tasty carbs once my BG had begun to drop. In the early days of Fiasp I would have expected even a modest correction to begin to lower BG within 30-45 minutes (unless immediately after eating), but over the next hour my BG continued to rise. The two corrections already on board almost doubling my meal dose. A further small correction at around 9.20pm did finally provide some BG lowering effect and I went to bed mid-range after a small snack. For anyone wondering about the condition of the infusion set - it returned to much more expected behaviour overnight and the following morning. But it was odd events such as this that rather cast a shadow on my Fiasp experiments. I began to opt for 3u and 2u over-corrections fairly often. I was also increasingly aware of a stinging sensation at the infusion site. Not always, and sometimes stronger than others. But many infusion sites were noticeably tender to the touch. Losing faith with Fiasp. Averages and SD rising. It was about this point where I decided that Fiasp was not going to work for me. I was nearing the end of the third vial of Fiasp and needed to put my repeat prescripton request in to restock. I decided to return to NovoRapid. I am sure I could have made it work given enough time, but I was losing trust with it and finding it not altogether reliable or predictable. This was relatively manageable when I was wearing a CGM sensor to keep track of where doses were not behaving as expected, but I generally only use sensors occasionally and I really need an insulin that I can trust while I'm not able to watch it like a hawk. Ultimately, I had wanted to try Fiasp to reduce or remove the need for pre-boluses, and to improve the speed of action of corrections. I had seen some evidence of these early on, but not for several weeks. And those positive attributes had apparently been replaced by a less than reliable action. I am quite disappointed if I am honest. I continue to see lots of accounts of people getting on really well with Fiasp, enjoying lightning speed and seeing significantly improved post-meal numbers. I have also seen other accounts very similar to my experience though. So it seems that Fiasp may be an insulin that just does not work well for some people. But for me - despite all its faults, NovoRapid has brought an immediate relief and return to significantly better results. Well... for the time being at least! Thanks for the review, interesting insights. Thanks for the info. Glad it wasn't just me having those problems. I tried it for 3 months and today I have reverted back to novorapid. Thanks for this really interesting. The no-lifing of many diabetics is terrifying... Wearing their still very much inconvenient and conspicuous pumps, checking their bgl a dozen times a day, injecting fast-acting insulin BEFORE meals (and of course carefully planning beforehand what and how much EXACTLY they're going to eat - restaurants are therefore not an option), acting like lots of hypos is normal, scaring passers-by shitless by doing it all in public... It's not a competition over a better score. Or, do you want to live FOREVER? Well, NOBODY CAN, diabetes or not. It shouldn't TAKE OVER YOUR LIFE. It shouldn't DEFINE WHO YOU ARE. What for? A couple extra years in the misery of old age? Sorry you feel that way DreamDweller. You are absolutely right, diabetes is not a competition, and while it becomes part of life it certainly should not define who you are. I think it is about finding the right balance for each person as an individual between outcomes (which I suppose include the possibility of developing long term complications) and day-to-day quality of life. And each of us will have a unique set of things that are 'fine' to keep doing annd those which are 'not worth it'. Hope you find your own balance. Incidentally, while I've never made a big show of Doing Diabetes Stuff in public places I've never hidden it either. So far in 27-odd years absolutely no one seems to have even noticed that I am doing anything out of the ordinary, and the only people who have ever mentioned anything are other people with diabetes who have simply given me a knowing smile and nod. ive been using this for the past week instead of novorapid which I have used for more than 10 years. I have had way too many lows now. I am surprised no one else is experiencing this. I am very active (work out 6-7 days a week) and eat an extremely clean diet. I swapped novo for fiasp one for one as instructed. Also changed by nighttime insuling from NPH to this brand. I had almost no lows before. This stuff is much stronger for me. I have been dropping morning doses last several days but overall its made my sugar reading jump back and forth all over the place. Maybe its just me, but I will continue to adjust over the next week or so but if things don't progress positively this insulin is NOT for me. I was so low sunday morning I started to lose vision, speech was impaired and I had to sit down. I was actually very scared - never been that low in my life and I an RELIGIOUS about monitoring my sugars. I test 10-15 times daily. So, it definitely is working differently on me than what I have read above. Also - you throw away the whole pen, that is insanely bad for the environment from the single cartridge to be thrown away once empty. No wonder its "more expensive". Anyways, maybe I come back to this thread in a week from now to provide an update - I guess if I end up taking less insulin overall its better for me than? Sorry to hear you've had lots of lows JT. I certainly had to dodge a few by spreading the insulin in the early days before the rapid action stopped happening. As with all things Your Diabetes May Vary I guess, so if you need less then do what works for you. You should be able to get penfil cartridges (I had vials) rather than disposable pens if you'd prefer to use a reusable Novopen eg an Echo to save on waste. I have been using Fiasp in MDI for about a 18 months now and will shortly be moving over to a pump taking my fiasp with me. I'm hoping that as I have been using it already I will have the "weirdness" understood. If its of any benefit I have observed many of the issues (missing insulin, increased doses etc.) on MDI. Obviously the main difference for me will be dropping my Toujeo basal and compensating with increased fiasp so I'm expecting a lot of learning on that front. My Hba1c on average over the last 18 months has been 6.4% (42 in new money) so the pump has a lot to live up to!